Health Minister Randy Delorey addresses the audience at a bill briefing at the legislature in Halifax on April 2, 2019. 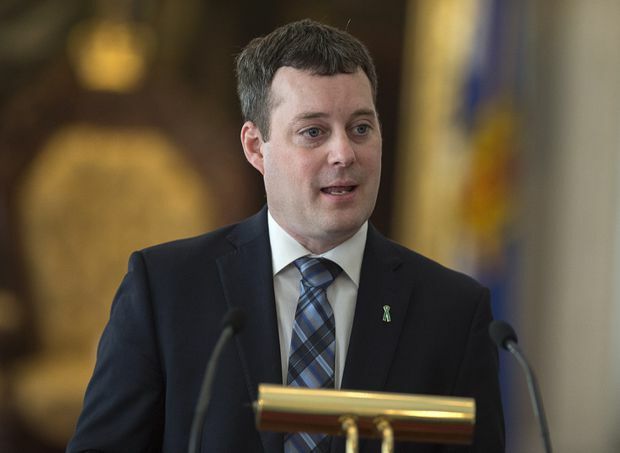 Nova Scotia legislation that presumes consent for organ donations is poised to become law, with a key official saying the new system will address concerns raised by civil libertarians and others. Once passed, the legislation isn’t expected to take effect for at least a year to allow time for planning, education and public awareness. Stephen Beed, medical director of the province’s Legacy of Life and critical-care organ donation program, says the regulations will take into consideration the concerns Nova Scotia officials have anticipated. Ms. Zwibel said many people who are opposed to presumed consent object to having the state telling them what to do with their bodies, and more discussion is needed. “It does seem like it’s the kind of bill where you’d want to take some time and hear from stakeholders and in this case everyone is kind of a stakeholder,” Ms. Zwibel said. In fact, the committee held a hearing on Monday, but deferred it for a day after no one showed up to testify. On Monday, only Dr. Beed and two other health officials appeared to speak. Kerry Bowman, a bioethicist at the University of Toronto, also said he was surprised at “how quiet” the overall reaction has been. Mr. Bowman said he sees presumed consent as problematic for Canadian society, calling it “a very bad fit with cultural diversity.” He said there are cultures with great concern about either the act of organ donation from a religious or cultural point of view, or from the diagnoses of brain death, which often leads to organ donation. Families will continue to be consulted about their loved ones’ wishes regarding organ or tissue donation under the legislation. As well, those under 19 and people without decision-making capacity would be exempt, and would only be considered as donors if a parent, guardian or alternate decision-maker opts them in. Dr. Beed said steps will be put in place to ensure the opt-out provisions are clear. Dr. Beed told the committee that within five years of the legislation’s implementation he expects Nova Scotia would see a 30-per-cent increase in organ donations. Mr. Reiter said his province needs to take steps such as creating an organ donor registry and getting more doctors to encourage organ donation. He said while Saskatchewan hasn’t ruled out an opt-out system, it believes there are potential legal issues. Dr. Beed said there may be changes that will be eventually needed to Nova Scotia’s law as science evolves, but he doesn’t anticipate legal troubles. “I don’t anticipate a specific sort of civil liberties kind of challenge, I’d be surprised by that,” he said.